To determine the extent of damage, our restoration process begins with an inspection of your property to identify the leading cause of water damage. We also bear in mind areas that could be prone to microbial damage if the water sat for over 24 hours. If our inspection reveals any sign of microbial infestation, then we employ remediation procedures in addition to dry-out to protect your property from any further damages. Our trained staff uses state-of-the-art equipment to evaluate damaged areas to find hidden spots of moisture damage. This step is essential, because structural damages or microbial growth can develop in the future. How Can You Avoid or Reduce Toilet Water Damage? Check after you flush—if you suspect that your toilet is clogged, simply wait a few seconds after flushing to verify if the bowl refills all the way or too much. If the water keeps rising, reach inside the toilet tank and lift the float. This will stop the water flow and avoid any toilet water damage. Thereafter, turn off the water supply valve at the base of the toilet. Perform bi-annual maintenance—check the supply valve, flush valve, fill, chain, and other components to make sure that they are working correctly. Ensure that you know how to turn off the water supply. Repair Smoke Damage to Walls—with fires there is a degree of smoke damage to your walls, wall paper, and paint. If the damage is minor, you can scrub it clean with detergents and bleach. Eliminate Mold and Mildew—since water is used to extinguish a fire, mold and mildew can occur. We highly recommend our professionals to handle mold and mildew, because it can cause serious health problems, contaminate furniture, carpets, clothing, mattresses, walls, and vents. Immediately air out every room and clean out all vents and filters. Repair Flooring and Carpet—in most cases, it’s recommended that you pull up any carpets that have water damage and replace them. Clean Clothing—ensure that you do not smear the greasy soot into the clothing or just throw the smoky clothes into the wash. Protein Fire—food from the oven or stove has burned, which leaves strong burnt food odors and smoke residue on contents and surfaces. 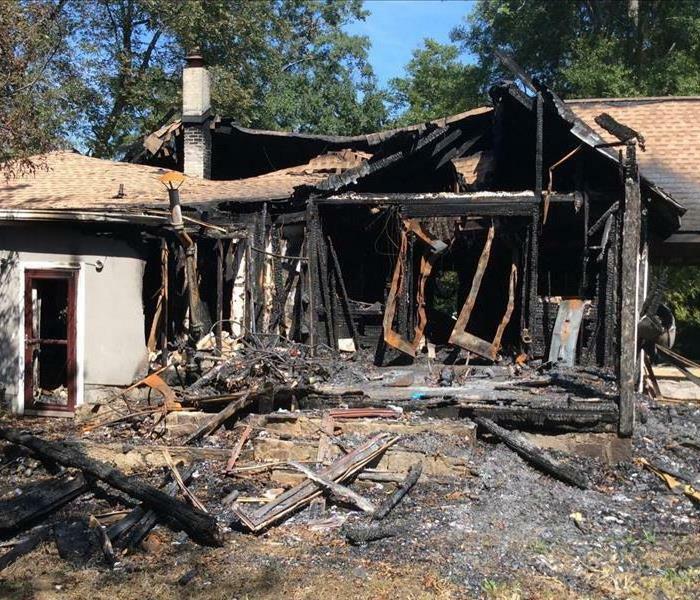 Complex Fire—multiple natural and synthetic items inside your home have burned causing black smoke residue on contents and surfaces and synthetic smoke odors. Here, emergency corrosion mitigation is needed to protect at-risk surfaces. Natural Fire—trees, shrubs and bushes have burned and smoke has penetrated the structure from outside, so smoke residue and odor are present. 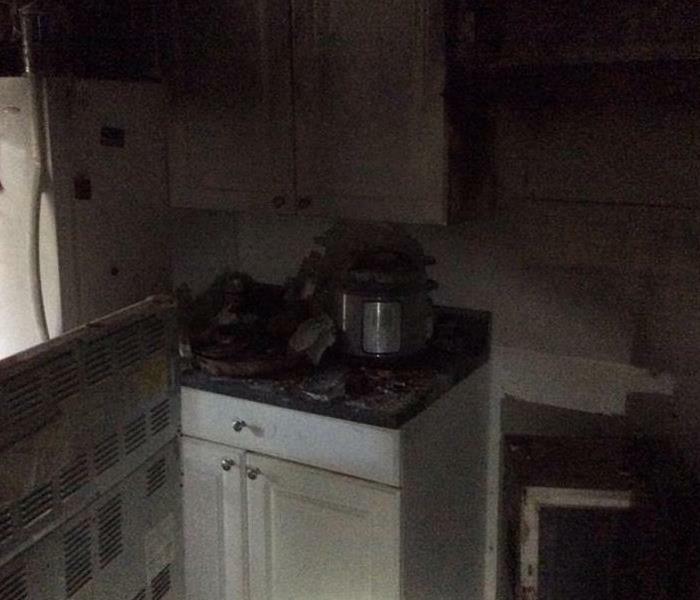 Furnace Malfunction—heating appliances, such as oil-fired furnaces have malfunctioned and caused smoke to be distributed throughout the property. Slow leaks in plumbing pipes or appliances, such as dishwasher, toilet, and garbage disposal that are not noticed immediately or visible to the home or business owner. Rooms or unseen often dark areas where humidity is too high and damp air is trapped for an extended period of time, such as crawl spaces, basements, and attics. Flooding events where water damage remediation work does not begin inside 48-72 hours. Cracks in exterior walls that allow water to seep into frame of home or business. Roof leaks, that is, leaks through damaged exterior siding. Molds produce tiny spores to reproduce. When mold spores land on damp spot indoors, they begin growing and digesting whatever they are growing on to survive. There are molds that can grow on wood, paper, carpet, and foods. Mold growth occurs when excessive moisture or water accumulates indoors, particularly if the moisture problem remains unaddressed. There is no practical way to eliminate all mold and mold spores in the indoor environment; the way to control indoor mold growth is to control moisture. Mold can grow almost anywhere in a property if conditions permit. If there is visible growth on painted wall surfaces, then homeowners should be concerned about what may be growing on the opposite side of the wall. If the wall remains wet for a prolonged period, then mold growth on the backside will be worse than on the front. As such, contain the workspace and remove moldy materials, followed by cleaning of salvageable framing are the best options. Our region is vulnerable to storms of all kinds. Whether we are hit by a hurricane, tornadoes, or ice storm, trees are especially susceptible to extreme weather damage. SERVPRO® of Panthersville offers storm damage remediation for both commercial and residential properties. We review your property after a storm hits and discuss that we can perform remediation services following tree damage that could cause harm to your family or destruction to your property. High winds, saturated soil, heavy ice, and snow accumulation can harm tree roots and weaken branches. 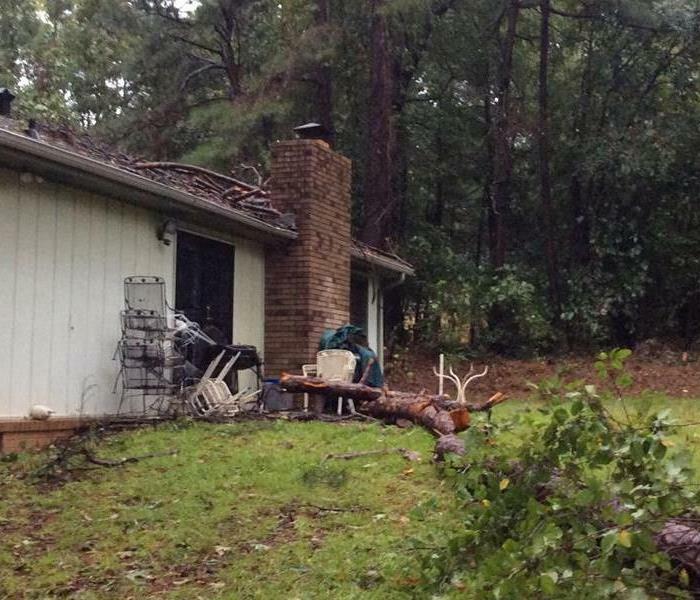 Most storm-related property damage occurs when trees and limbs fall, crack, or split. Our Production Technicians work to cut damaged and partially severed limbs and clean up plant debris. Unless a tree presents a hazard that cannot be remedied, we rarely advise removal. We do everything we can to maintain your landscape’s beauty as it was before it was affected by storm damage. The weather is unpredictable and so you never know when a severe thunderstorm or other natural disaster is going to blow through town. But, when it occurs, storm damage happens fast gusting winds knock down structures, hail damages roofs, lightning strikes, debris flies into buildings, torrential rain floods offices, and so forth. When something like this happens, you don’t have to face it alone. Choose storm damage remediation services you can trust with SERVPRO® of Panthersville. Our certified disaster recovery Team has the expertise and experience required to minimize potential damage and secure your property. Contact us 24 hours per day. Our rapid response not only gives you help right when you need it, but also it can result in lower storm damage repair costs and/or limited contents damage for your business or home. Know where your emergency water shut-off valves are located, and have a contingency plan in place in case you are unavailable. Create an emergency plan with directions for what to do in an emergency as well as a list of phone numbers of approved companies to call in an emergency situation. Ensure that someone you can trust has the authorization to make decisions if you are unavailable. It is a good idea to contact SERVPRO® of Panthersville who provides emergency response before disaster strikes. You can ask our IICRC-certified Production Team any questions you might have about our services or experiences. How quickly cleanup begins will impact the size of the loss. Time is of the essence when commercial property has been damaged. The professionals at SERVPRO® of Panthersville understand the importance of getting to the site of the damage, quickly assessing the situation, and then getting the necessary equipment down there to stop the spread of damage, contain the work area, and get to fix things up quickly and efficiently so you can get back to profitable work as quickly as possible. We have the tools, skills, experience, dedication, and the training to get the job done. There are many different challenges when it comes to restoring your commercial building, and that is exactly you should not rely on just anyone. You need professionals who know how to handle these types of work environments and are committed to providing you with the absolute best service each and every time. When it comes to water damage, the first 48 hours are essential. That is why you can call SERVPRO® of Panthersville 7 days a week, 24 hours a day. The sooner our Production Team arrives to get the drying process started, the better. Waiting can increase the risk of lasting damage to structures, as well as the risk of mold growth. 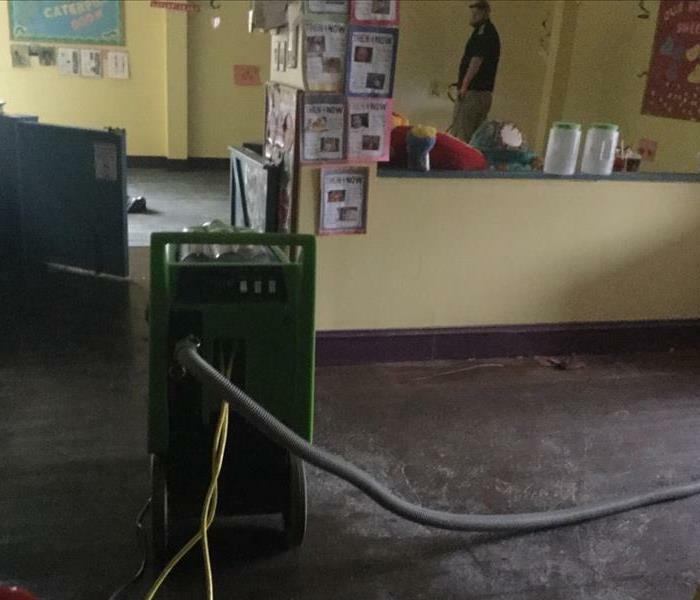 A Child Care Center in Chamblee, GA experienced a water loss from a broken pipe. When it comes to flood damage, water extraction, and the restoration process, nobody does it better than we do. From the initial dry-out to final restoration, our Technicians are able to take care of you during the entire process. Water damage can damage carpet, drywall, floors, and a whole lot more. The longer the water sits, then other problems can arise such as mold and mildew. 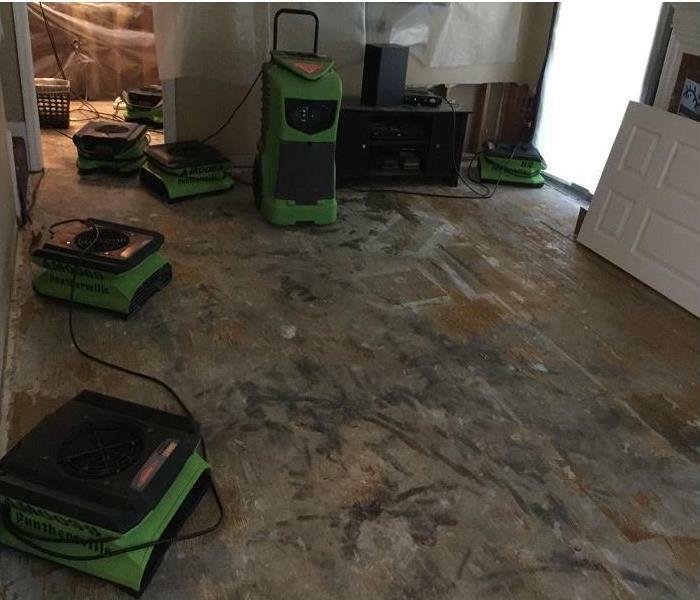 SERVPRO® of Panthersville Technicians are highly trained and certified in water damage restoration. In most cases we can dry out your property in as little as 2-3 days. Fire mitigation is a series of steps that you can take to reduce the risk of a wildfire consuming your property. It includes assessing the risks around your property, recognizing the wildfire dangers and your responsibility in mitigating them, thereby creating a defensible space. It involves how and where you store materials around your property, and also consider the health of your trees to determine the need for trimming or removal. Black mold is most likely to appear in areas of the home that are particularly warm, humid, and damp. Basements or crawlspaces that may have leaks or other sources of moisture are often susceptible to toxic black mold growth. Black mold is readily identifiable by its color; whereas most other molds are green or gray in color, toxic black mold is a dark black. Mold spores can quickly grow into colonies when exposed to water. These colonies may produce allergens and irritants and have the potential to cause other health effects. Before mold remediation can begin, any sources of water or moisture must be addressed. Otherwise, the mold may return. Fire-related services include debris removal, board up and securing, cleaning and detoxification, elimination of odor, removal or restoration of damaged materials, dry-ice blasting, and encapsulation. Do not hesitate to contact the professionals at SERVPRO® of Panthersville for any fire-related services. Water mitigation is the process of reducing or preventing the amount of water damage that happens after a flood, a leaking roof, or any number of water-related reasons. You can prevent additional damages and cost by taking immediate actions, such as contacting SERVPRO® of Panthersville professionals. Dehumidifiers draw out the moisture trapped under sodden carpets and beneath floorboards. Although a dehumidifier may not save all your furnishings, it is an important tool in minimizing the damages. Having a dehumidifier over a vent can help dry beneath floors, and other hard to reach areas that a fan could not cover. SERVPRO® of Panthersville has the expertise to perform your commercial water, fire, and mold remediation services. Our Production Team is also certified with IICRC, and they have obtained the Water Damage Restoration (WRT), Applied Structural Drying, and Carpet Cleaning certifications. 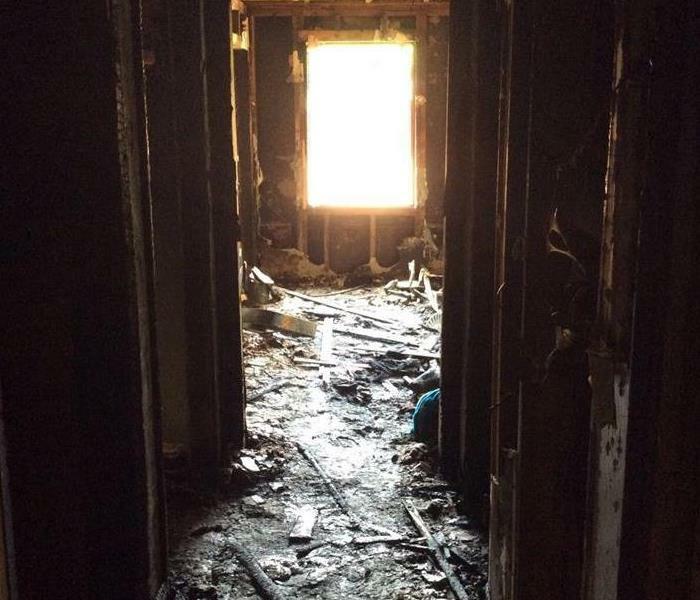 Fire is a life-threatening event that causes damages from soot, smoke, and even water damages. Smoke can literally invade every crevice of your home and contents and cause invisible damages. SERVPRO® of Panthersville can help clean the structure and contents of your home. If you see signs of mold or suspect that it has infected your home, then SERVPRO® of Panthersville professionals is the best choice to perform mold removal, remediation, abatement or mitigation. Our expertly trained Technicians can assess your property with the right equipment to help remediate the problem and prevent long term damages. Areas of your property that are damp or have flooded in the past are highly susceptible to mold growth. Mold may be invisible, but a musty smell, the peeling, or discoloration of drywall and wallpaper all serve as warning signs. Allergic reactions such as frequent sneezing, coughing, congestion, or sore eyes can also be signs. 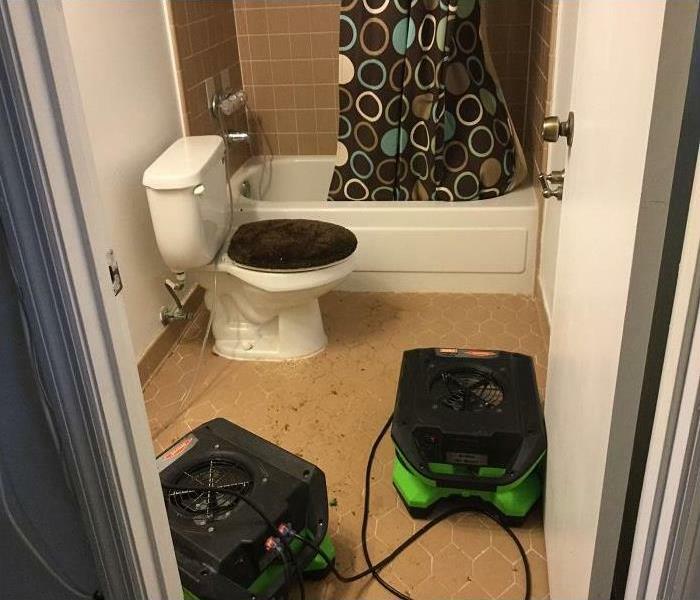 The experts at SERVPRO® of Panthersville perform thorough initial investigation to assess the extent of water damages before we formulate any strategy. This ensures that the solutions delivered are exactly your property's requirements. 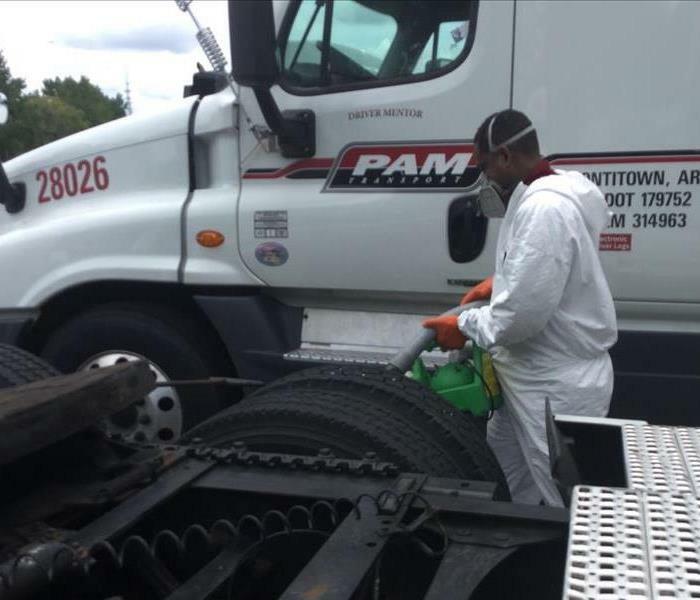 SERVPRO® of Panthersville Production staff are trained to safely clean and remove biohazardous substances and dispose of them accurately in accordance with OSHA and health regulations. Biohazardous materials are substances that may expose you or others to dangerous pathogens or diseases. Our Production Technician staff are thoroughly trained in all aspects of the job. One requirement is to check the moisture temperature daily and make records of each day's temperature. Our Production Crew Chief is hard at work removing each spot from the carpet. He inspected the carpet, carefully moved furniture, vacuumed, treated spots, thoroughly cleaned the carpet, and performed a post-treatment inspection with our customer to ensure that she was satisfied with the carpet cleaning. Do not hesitate to contact the carpet cleaning professionals at SERVPRO® of Panthersville. 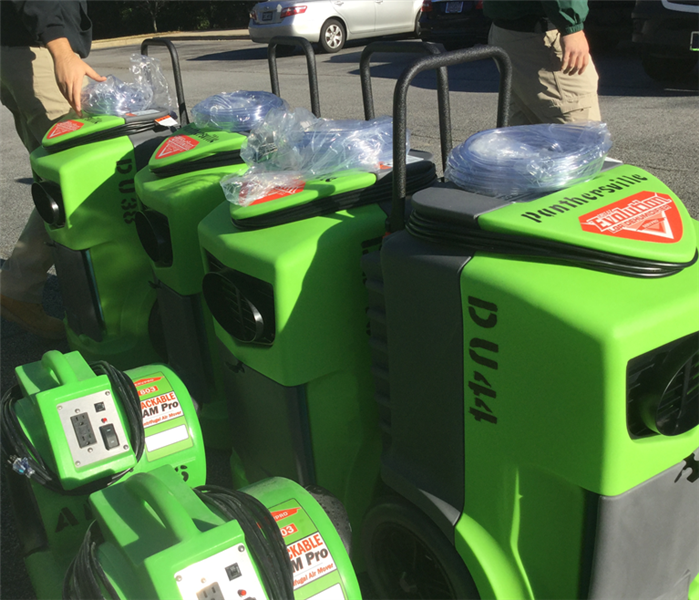 SERVPRO® of Panthersville is Fully Equipped! No matter how big or small the projects are...SERVPRO® of Panthersville has all the specialized equipment to ensure that each job is thoroughly completed. These equipment include Generator 25kVA/20kW, Centrifugal and Phoenix AirMax Air Movers, and Dehu Evolution LGR. Our crew caught a beautiful picture of the Marina in Savannah, GA. Our staff had the pleasure of assisting in recovery efforts after Hurricane Matthew in October. This picture was taken just 3 days after the Category 4 Hurricane pounded Savannah, GA.
Our employee works diligently in our Panthersville office to handle all customer inquiries. She plays a crucial role in the daily life at SERVPRO® of Panthersville by meeting deadlines, dispatching calls, and assisting other departments. Our signature SERVPRO® van is out and ready to respond to any disaster no matter the size. Call us today at 678-515-8602. We offer 24 Hour Emergency Services. "Like it never even happened." A great view of the Storm Team Trucks in gear to restore damages of properties caused by Hurricane Matthew in Savannah, Georgia. 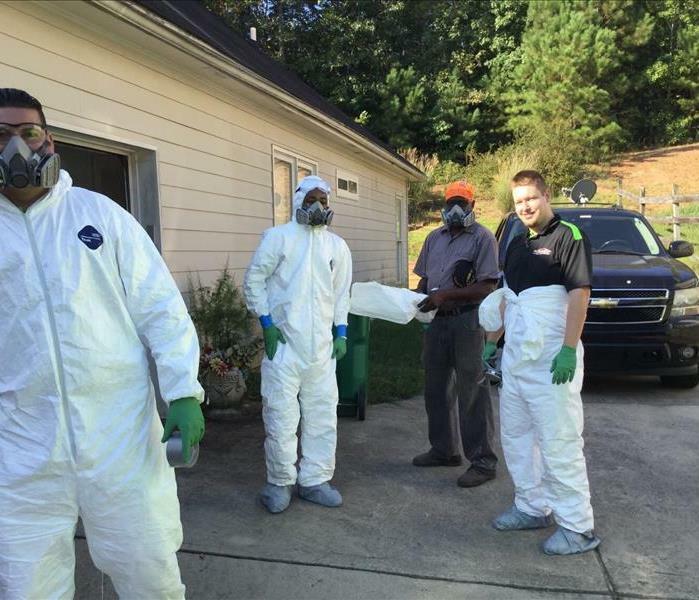 SERVPRO® of Panthersville was happy to assist in the recovery effort. Our Team gearing up to travel to Savannah, GA in order to assist in recovery efforts after Hurricane Matthew. We use advanced inspection and extraction equipment to find the water and remove it as quickly as possible. 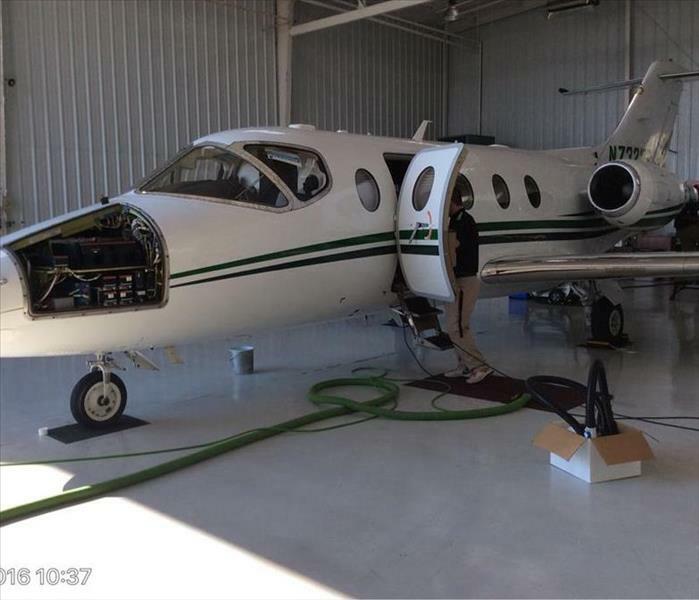 Our team working hard on eliminating an odor issue on an Atlanta Airplane. The customer was so pleased with our work that he will be using our services in the future. 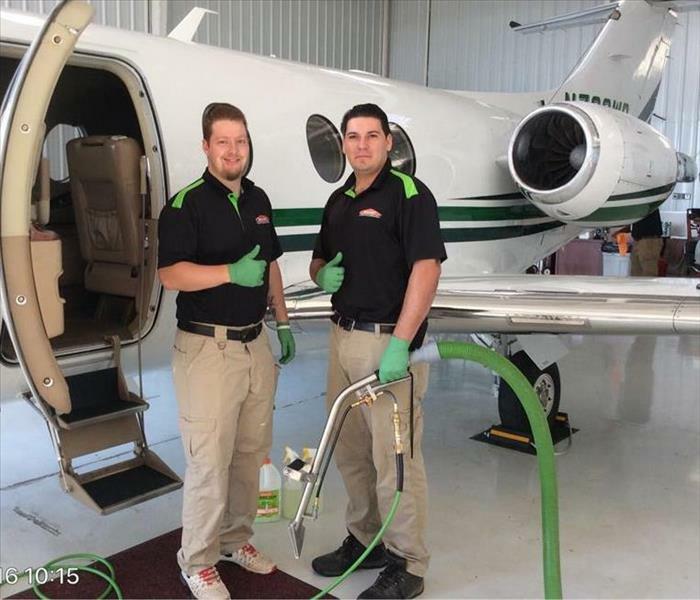 Production Team getting ready to take care of an odor issue on an airplane in Atlanta, GA. As experts in deodorization, SERVPRO® of Panthersville staff is trained to identify and eliminate offensive odors. Our Crew Chief headed out at 8 am to work on a Water Loss in Atlanta, GA. Our Production Technicians monitor and document the drying process to ensure your property is back to normal. Our team suiting up for a biohazard cleanup. Exposure to biological and chemical contaminants can pose serious health consequences. A failure to properly remove such substances can contribute to unhealthy and dangerous environments.